Home Blog Will Alibaba’s Data Lake Analytics (DLA) Services take the Native Cloud Solutions by Storm? Will Alibaba’s Data Lake Analytics (DLA) Services take the Native Cloud Solutions by Storm? Alibaba Cloud Services has introduced Data Lake Analytics (DLA) services, which is an interactive analytics service that utilizes serverless architecture. Being a ready-to-use- service, DLA does not require any prior setup of infrastructure or any upfront management costs. Data Lake Analytics does not require any ETL tools and uses a standard SQL syntax and business intelligence (BI) tools that efficiently analyze the stored data in the cloud at an affordable cost. Before understanding the whole concept of analytics penetrated into the cloud-stored data to get the desired result, let us understand the concept of Data Lake first. Data Lake is a trending concept in the big data industry these days, which allows data to be stored in its natural format, typically as an object blob or a file. Data Lake is a massive repository that implements big data association analysis across different heterogeneous sources of data without undergoing any pre-processing of data, such as ETL and data migration. This reduces huge costs and facilitates great user experience. The Data Lake Analytics (DLA) Services from Alibaba Cloud Services is billed based on actual usage and requirements and there is absolutely no need to maintain instances in DLA. Using an SQL interface it interacts with user service clients, which signifies its capability to compile with standard SQL syntax and hence providing a variety of similar functions, as well. DLA allows users to fetch and analyze data from various data sources or locations such as OSS and Table Store for optimizing the data processing, analytics, and visualization to deliver great insights leading to better decision making. Secure Network: The fully secured and logically isolated service of DLA is based on Virtual Private Cloud (VPC) technology. Reliable Access-Control: a comprehensive authorization mechanism is followed which is based on RAM/STS systems, that are highly scalable cryptographic key management based on Key Management Service (KMS). Multisource Data Federation: The cloud-native analytics approach help perform data federation across heterogeneous data sources including OSS, PostgreSQL, MySQL, NoSQL. Cloud Native Ecosystem: The cloud-native ecosystem of DLA supports MySQL client’s tools, tightly integrates the BI tools, and is fully compatible with ANSI SQL 2003 syntax for a complete range of comprehensive function support. 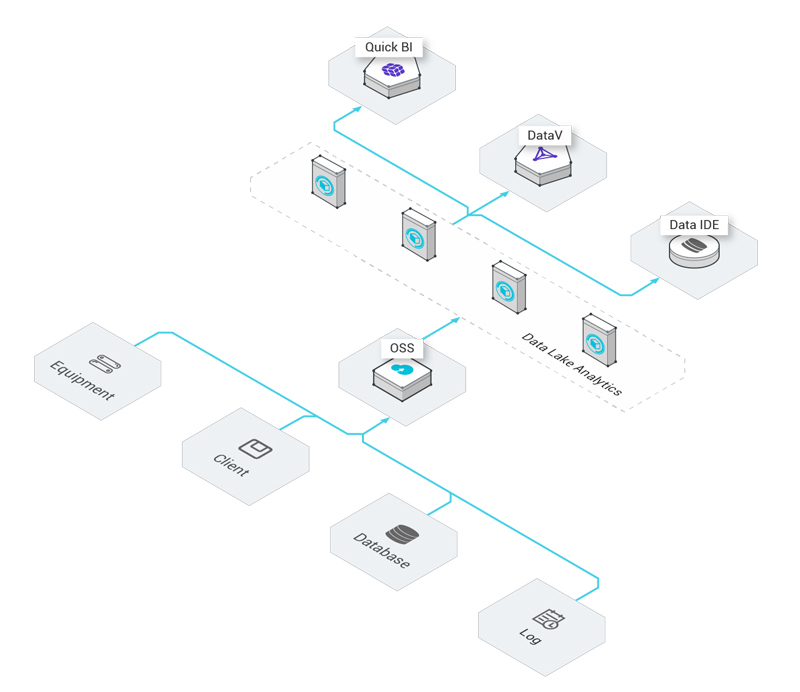 Serverless Architecture: Being a serverless architecture, DLA is very cost effective and does not require any long-term investments on data analysis. Users can upgrade the DLA services with zero downtime for rapid and agile product iteration. DLA being extremely fast offers analytics for a huge pool of data ranging from TBs to PBs for all the applications and delivers what it promises.